Many Clicky users have asked us about site monitoring. We are happy that this is top-of-mind for some of you because its importance should not be understated. Often we will receive emails from Clicky users asking why there was a dramatic lag in visitors tracked or a complete drop-off altogether. While there can be many explanations, it is not uncommon that the site itself went down unbeknownst to the site owner. Standard web analytics will not be able to tell you this, but site uptime monitoring and alerts will. With this in mind, we are excited to announce a closed beta in partnership with Monitage, a newly-developed site uptime monitoring service by Roxr Software (that's us). We have integrated Monitage into Clicky to give you a bigger picture of the health and activity of your web sites. Monitage monitors web sites from five locations around the world (three in the US, one in Paris, one in Japan) and only declares a downtime event if a majority of its servers agree on it. This prevents network hiccups on the monitoring end from sending false alarms. Pro Plus users and above receive access to the Monitage closed beta. When we officially launch, you will have the ability to create up to 30 checks per site with intervals as fast as 1 minute, but during testing we want to keep resource usage within a reasonable range. So for the time being, we are limiting to 3 checks per site with a max interval of 5 minutes. We expect to officially launch within 4 weeks, at which point Monitage will also be available as a standalone service. To access Monitage, go to your site dashboard and click the Uptime tab. You can create checks for HTTP, HTTPS, SSH, FTP, IMAP, IMAPS, and ICMP (ping). We've also created a dashboard module. You can also access uptime stats from the API. Check the API docs and search for "uptime". 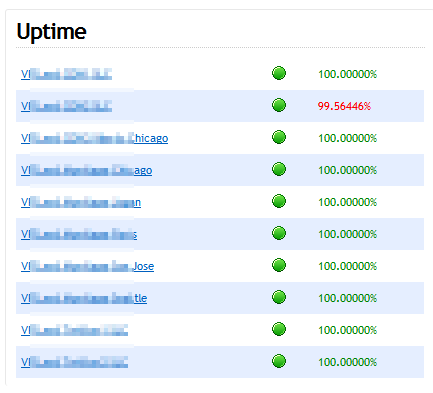 type=uptime will give you the current status of all of your checks for a site. 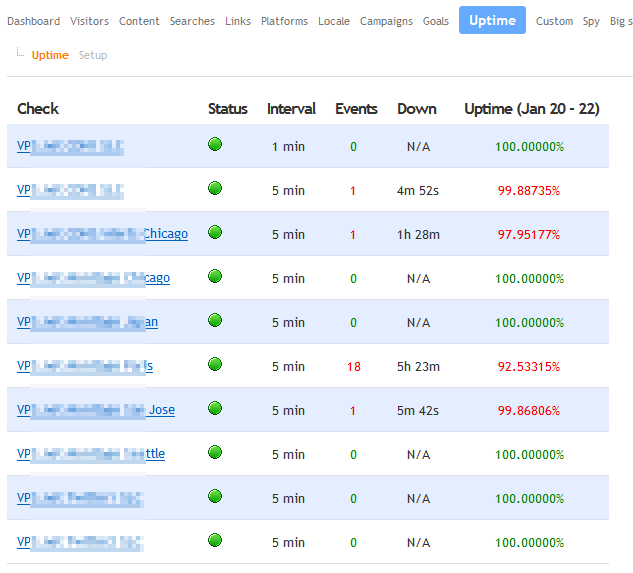 type=uptime-list will give you a chronological list of all downtime events for your site for the date range requested. Last, we added uptime stats as an option in email reports as well. When Monitage officially launches, we will determine what intervals and types of tests will be included with Clicky Pro Plus plans and above. We are asking that you test Monitage, and let us know your thoughts, what you like, don't like, and want to see. As Monitage is in its infancy, we want your feedback to help mature it into a stalwart companion to Clicky. Note to white label customers: Monitage will be added as an option to white label service when it officially launches, but for now it is only available to Clicky users. Update, Feb 4: Just pushed an update that integrates uptime monitoring into the Big Screen report. Also added web hooks to the setup page. Enter a URL and we will POST a JSON object (documented in the setup page) to that URL for events. Also we've been getting reports of false positives since launch, we are pushing some updates later today that should fix it entirely, or at least close to. It appears that the end-points accept a fully-qualified URL so does that mean I can setup alerts for several different websites within the uptime page of one site? This is great. I just set up a basic uptime check for two of my sites and will give it a go compared to the separate service I'm currently using for uptime monitoring. One feature that I would love to have is the ability to do something along the lines of webhooks in the event of downtime. Even just pining a particular URL (per uptime check) with a specific GET request would probably do the job. The use case being automatically restarting a VM or Azure/Heroku site in response to a site being down. 99% of the time, that's what I need to manually do when I get a downtime report now. Having a way to automate that without setting up extra plumbing of my own would be a really nice feature. How does this differ from something like Pingdom? Even if it's the same, it is probably still more convenient for me because I check clicky regularly. That said, I am curious if there is any other uses or abilities for monitage. Shaun - yes you can enter multiple URLs to create multiple check points for a single site. Dave - web hooks are a great, we'll add that in. John - yes this is similar to Pingdom and other services, although a lot of uptime services only do http/https monitoring whereas we offer a number of other options too. And yes a nice benefit with Monitage is that it's integrated into your Clicky stats. We also do content matching with http/https checks, e.g. verifying that not only the endpoint is up but that it's returning what it's supposed to. Will you also be offering response time reports? Could you fix the problem ? @Dave You could accomplish a web hook with an 'Pipe to a Program' email script. miracl, I verified your account has access. You may need to re-login. Hey Sean: for clarity sake. When you officially launch Monitage will Pro Plus and above users need to pay additional for Monitage or will it be included in our annual subscription? Does out allow an alert top be emailed our sound? Hours often would an api check update? Woohoo! This is a feature we've been waiting for. Very convenient guys. Thank you! Wow, very cool guys, thanks! I've always wanted to have a way to track downtime for all my sites. Would be nice to have this on the Big Screen dashboard. We've been using this since the house it was announced and it's working great. We have a custom plan (250 site / 400,000 views) so we're really hoping to get 1 minute intervals once this is out of beta (or sooner?). Is there an anticipated date for this, and have you ironed out the details as far as what plans will be getting what levels of access? Thanks Shaun. Glad it's working well for you. We have received a decent number of bug reports so we still have some bug squashing to do before it's ready. Also we're waiting until the Monitage web site is ready so we can launch it as its own service at the same time. So it will be a few more weeks. Just pushed an update that integrates uptime monitoring into the Big Screen report. Also added web hooks to the setup page. Enter a URL and we will POST a JSON object (documented in the setup page) to that URL for events.